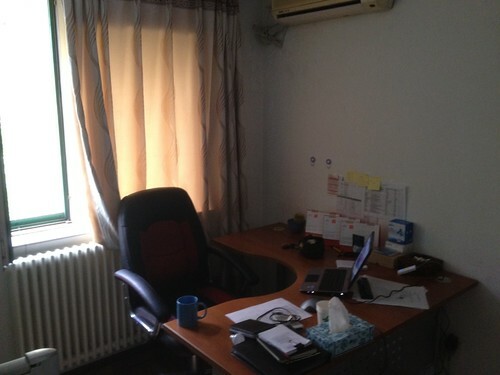 This is my office in the capital of TaobaoLand. It is half the size of my office back in D0ngguan but I am not complaining. The capital office itself is a smaller office than HQ and so I am not expecting it to be par for the course. As you can see, I am back against the window which I have to pull the curtains or I can't see anything on my laptop screen due to the glare. The room is well equipped with air-conditioning for the summer and heat radiator grill (behind the chair) for the cold winter months. Anyway, as I am writing this, a shower just passed and we are now at a comfortable 25 degree Celsius. An opened window to let the cool breeze in is good enough. Oh and my chaps fixed the ceiling light. I can see what I am typing again. In return for their help, I will be installing Freegate on their laptops for them to surf more sites after work. p.s. If it is any consolation, it is still bigger than the office I had when I was working in the crap (no pun intended) company in Singapore a few years back.